Beka Cooper is a rookie with the law-enforcing Provost's Guard, and she's been assigned to the Lower City. It's a tough beat that's about to get tougher, as Beka's limited ability to communicate with the dead clues her in to an underworld conspiracy. Someone close to Beka is using dark magic to profit from the Lower City's criminal enterprises—and the result is a crime wave the likes of which the Provost's Guard has never seen before. Wow! What an amazing book! It totally came out of left field too. I have read all of Tamora Pierce's books (there are a TON of them),but it's been a LONG time since they've crossed my mind...think my freshmen year of high school...I forgot how amazing the worlds that Pierce creates really are! Reading Terrier made me want to go back to the beginning and start all of the Tortall books over again from the beginning. The stories have such depth, not only within the plot, but with the characterization as well. There are twists and turns that throw you completely just when you think you have them figured out, and the characters come to life in a way that is seriously fantastic. I really enjoyed the journal style entries that the book contained. Not only do you get the main story of Beka, but you also get to have a glimpse into George's (one of the main character's from Pierce's Alanna series) early years as well. Beka is an ancestor of George Cooper, and she works as one of the Provost's Dogs, which are an early kind of police officer. As a "puppy" for the Provost's Dogs, Beka is basically in training. She follows Goodman and Tunstall (two senior Dogs) around the lower city and investigates crimes. She also has a very special way of gaining information. She can hear the souls of the dead. 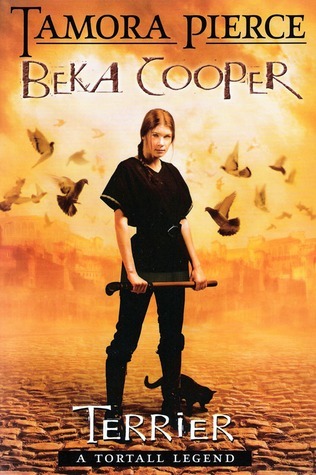 Though this series is technically a prequel to all of the other books that are set in the land of Tortall, I feel like the Beka Cooper series can stand on it's own as well. You might want to read the other ones first because you will understand the court system, the rogue system, and the concept of mages better, but you don't need to read anything else. Though I highly recommend that you do. Because they rock my face off. The way that Beka communicates with the dead is through an odd, but entirely unique way. She hears the dead souls who ride on pigeons, and also through "dust spinners" or mini tornadoes. The concepts may seem odd, but the way they are explained in the story makes perfect sense and it is definitely a completely original concept. Beka herself is a really unique character. She possesses none of the irritating qualities and cliches that are ever present in teen literature today, such as guilt over a parent's death, a perfect older sibling, or (gag me) a love triangle. The closest thing TO a love triangle is a male thief/assassin and two female assassins who are in an open relationship...talk about unheard of in teen lit! LOVED IT! I loved how understated the magic was in this book. Despite the fact that magic is infused throughout the story, it is never really the main focus. It is just another tool in Beka's crime-fighting arsenal.And the denizens of Tortall treat it with acceptance, as if magic is just a natural occurence. I found that to be very refreshing. I was actually more interested in the day to day functioning of the Dogs and the crime in the city than I was in anything magical. I loved that the Dog's are fighting for good, but are vaguely corrupt because they accept bribes and help from "rats" or the criminals in the city. The "Rogue" is who controls the crime, and is basically an old-school version of a mob boss and is responsible for the well being of the poor and lowly of the city's people, and he bribes the Dog's to turn a blind eye to some of the bigger crimes like drugs and weapons so that they can focus more on riots and murders. The whole dynamics of this world are so well woven together and so fascinating that I could easily lose myself in the world of Tortall for weeks...I'm seriously considering dropping all of the books in my TBR pile so that I can read the other books all over again. What I love about every single one of Pierce's books is that they always revolve around action, plot, and the world that they are built in, rather than the relationships between the characters. Not that the relationships are neglected, because you get a great deal of character development and emotional dialogue, but the actual story is paramount in the mind of the reader. There were two overlapping mysteries that needed to be solved in this book. Someone was hiring a dozen or so workers at a time to "dig a well" who then disappeared without a trace, and someone called the "shadowsnake" was kidnapping children from the lower city and holding them for ransom. If the parents refused to pay, the child would be found dead within the week. It was amazing the way all of the character interactions and mystery flowed together to create a seamless story that had me on the edge of my seat the entire time. It is obvious that Beka cares for the lower city, despite it being the equivlent of the ghetto of modern society. It is her home and she wants to do everything in her power to protect it and the people who live there. I LOVE Tamora Pierce's books and I definitely think Terrier is one of her better books. I do agree that sometimes her books come off a little young, but there is so much there in terms of characterization, plot and developed worlds that they can draw anyone in. Wait until you read the next one, Bloodhound. It's just as good! I've read Terrier and Bloodhound. I can't wait for the 3rd book to come out later this year. The characters are great, although this wasn't my favorite series by her. I don't know why it didn't make the same connection with me. I did not make the connection between George and the Alanna series! I don't know what I was thinking. I need to reread those books so I can remember. Just curious, what is the difference between High Fantasy and regular Fantasy? There's kind of a blurry line between Fantasy and High Fantasy. Fantasy can be anything from other worlds, to other planets (without the sciencey aspect that makes it sci-fi) or urban fantasy. High fantasy is a particular "traditional" world. Think horses and knights and stuff, and magic is accepted as every-day. So...High fantasy is a slight sub-genre of regular fantasy..lol hope some of my rambling helped! all of a sudden ive seen this book everywhere it does look extremely good.. your review has convinced me to get my hands on a copy for sure! Tamora's books tend to be really good! It's a hit or miss with fantasies. I loved Tamora's books Tricksters Choice and Tricksters Queen. I am super happy to know all of her books are good!